Individuals with ASD often have challenges in accessing appropriate healthcare, with many caregivers citing challenges in navigating between sectors (health and social services), transitioning across age groups, and finding specialized expertise. These challenges can be confusing and stressful for individuals with ASD and their caregivers. As a result, emergency services can end up being one pathway to mental health care. The current study examines emergency service and psychiatric hospitalization in a large sample of adolescents and adults with ASD in Ontario, as part of an ongoing longitudinal study of health care service use in this population. A number of individual, family, and service characteristics are implicated as correlates of service use, and have important implications for supporting health care interventions. Jonathan A. Weiss, Ph.D., C. Psych. 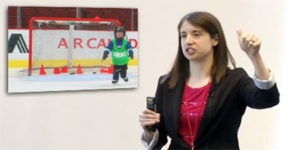 is the Chair in Autism Spectrum Disorders Treatment and Care Research at York University. Dr. Weiss’ research focuses on the prevention and treatment of mental health problems in people with ASD and/or intellectual disabilities (ID) across the lifespan. He conducts studies into how people with ASD and with ID access mental health care in Ontario, and is interested in their health service needs, their emergency service use, and their experiences of psychiatric crisis. Families play a critical role in the health of people with ASD and with ID by providing them with care and enabling their access to health services, and he is currently focused on learning about the experience of family caregivers. 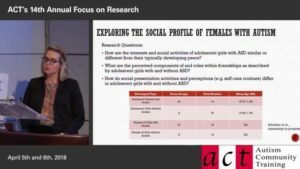 Thriving in Youth with ASD: What Does it Take?